You won’t believe what this 5 year old did for her Mother! Dina stood in front of her Chinese teacher and hesitated – should I buy more stickers for myself today? She shook her head, no, not this week. We were amazed at how Dina, a K1 student at KidStartNow Chinese enrichment, decided not to buy stickers for herself. But we know why: she has a greater goal. To celebrate Mother’s Day, KidStartNow challenged our students to collect as many digital gold coins as they could over 3 weeks. These gold coins would determine how many stickers they would be able to buy to create a special present for their mums. These gold coins are earned for behaving well and participating enthusiastically in class. And to maximise the number of stickers they could purchase for their mums on week 3, our students also had to decide if they wanted to spend less on weeks 1 and 2. That was exactly what Dina chose to do – spending just a third of her usual amount of coins on stickers, and saving the rest. “I am very proud of Dina. Even though Chinese is not Dina’s Mother Tongue, she is so enthusiastic about answering questions in class and singing. She really wants her mother to be proud of her,” says Hong Mei, her teacher. We were blown away when Dina and her other 3-6 year old classmates all showed this willpower. And it was all worth it when on week 3, our students were able to use their hard earned coins to purchase stickers to create a personalised photo frame and card for their mothers. In fact, some used up all the coins they had earned the entire term. But our kids had a final surprise. The best performer in each class over the 3 week Mother’s Day challenge won their mum a special present. 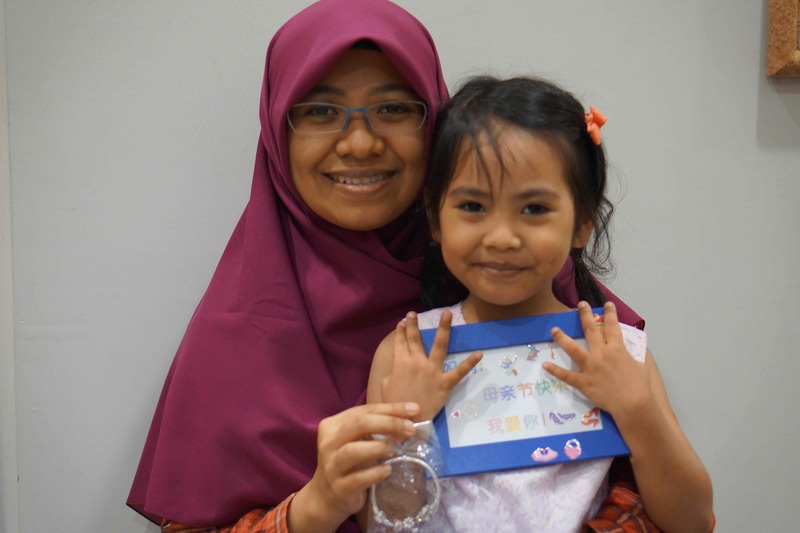 Dina had beat out 7 other classmates, to win her mum Huraizah, a special bracelet! Her efforts had really paid off. “Dina is very proud of her photo frame and card, and will show it to my friends and read the Chinese characters to her,” says Huraizah.